Seven Ooters assembled at Robert's for a pre-journey coffee and piece of home-made gingerbread. Davie was still poorly (come back soon Davie, we are all missing Holly), Jimmy was waiting for the man from Dell Monte (he say no to any other day of the week), Ronnie had had a family bereavement and Peter was ... somewhere else. Having set off at 9.05am we arrived and parked (more about this later) at Dollar by 10.20am. 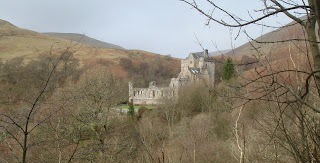 It was up the Dollar Glen to begin with, passing by Castle Campbell (even by this time the writer was taking his usual tail gunner position), and on up a well marked path before stopping for coffee prior to the real ascent of the day. 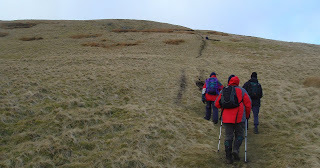 The climb to the top of the hill was steep with the weather changing quickly from wet to dry - thankfully mainly dry. However Johnny has an insurance claim pending regarding his torn waterproofs, caught on a wire fence. As the summit approached the wind got stronger and colder making possible only brief stops to admire the views - Kincardine Bridges, Longannet and Kincardine Power Stations, Grangemouth and beyond. Lunch was taken huddled together in a stone shelter at the top and, given the ferocity of the weather, it was not lomg before we started off on the downward part of the walk (downward, I should know better by this time). At least the first part was down and made at a quick rate of knots as the hail was biting into our faces. The idea was to climb up on to a ridge that would eventually bring us round to Dollar again. 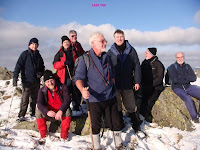 Paul led the way using his GPS to great effect and liaising with Alan and Rex who were also equipped with the latest technology. To be honest I'm not sure how many other tops we navigated (Johnny says it was the Four Tops but lost all credibility by recounting how he used to enjoy their lead singer, Marvin Gaye). The wind was still strong enough to blow us occasionally off balance and with Dollar coming into sight a decision? was made to veer off the route and go straight down the hillside. 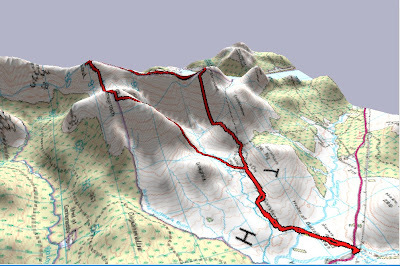 This being accomplished, and in the lea of the wind, the walk back in was relatively straightforward via the steep-sided Glen. It was a weary group who arrived back at the cars at 4.15pm. Another decision was taken to go back to the King's at Fenwick for refreshments with the result that the last of the Ooters got home to their loved ones at 7.30pm - they saw their wives later. A long day. appealed to Rex as, in fact, it was Ian's car. Ian had kept 'shtum' throughout the altercation. The old geezer then appeared at Paul's car where Johnny was changing and complained about 'our rude little friend up there'. Johnny assured him that we did not mean to cause an issue and apologised for any inconvenience. This apparently was all that he was looking for - a word of apology - and hinted that a day on the hills may have affected Rex's mental stability. We assured him that Rex was an Australian (he didn't understand Antipodean) and that the day on the hills had had no impact, he was always like that. This incident provided much needed hilarity after the tortuous day and was recounted with relish at the King's. Following on with the Spaghetti Western theme the incident could be renamed 'The Good, The Bad and The Ugly'. Mix and match yourselves who is who between Rex, Johnny and the old guy. Where the wild falcon glides? St.Valentine’s summer came late this year, two days after the big celebrations, but when it did, the warmer weather fairly shifted the frost and snows of the previous two weeks leaving us with soggy ground and high burn levels. And as is typical of this time of year, the mild spell was accompanied by overcast skies blocking out any drying sun. Yet, as we found out later, the visibility was remarkably good under this cloud cover. 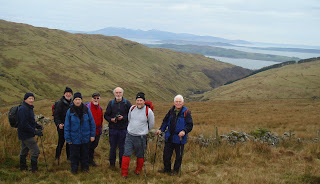 Eight of us gathered at Largs today. Rex was still in foreign airts, Ian was off for a romantic few days with his good lady and Davie was laid up with thinuthitith*. Why Holly was absent we have yet to find out. 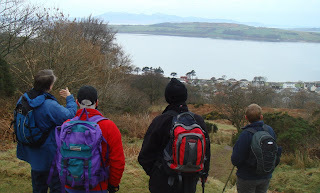 However, eight of us gathered in Largs for another walk around the Gogo Glen. We started uphill almost immediately, at first gently and almost imperceptibly through Douglas Park. Clumps of snowdrops under the trees of the park showed how early in year this was though the day was reasonably mild. It was a pleasant stroll though the park. But then we were pointed through a gate onto the open hillside and the slope steepened dramatically. Some person, in considerate mood no doubt, had laid railway sleepers to form steps. But these steps were small – women’s steps – and had to be taken two at a time for comfort. And they were greasy with the dampness of the morning. Care was taken. We have the feeling that Peter’s reign as official group girn may be at an end for the one complaining most on the ascent was Ronnie. And his complaining got louder as the sleepers continued. Watch out Peter. Approaching the view point on Castle HillBut these sleeper-steps did get us up the steep slope quickly and we were rewarded for the effort with a superb view, even under the overcast conditions. Largs lay immediately below us, spread out like a map; the Firth ran northward to disappear behind the headland of Inverkip; the hills of Arrochar and Cowal formed the northern skyline, running southwest to Knapdale and Kintyre; the Clyde islands shaped the nearer panorama, the low lying Cumbrae and Bute being contrasted with the alpine-like peaks of Arran, looking particularly rugged today with fangs of dirty-looking snow trailing down from the ridges; even Ailsa Craig in the far south-west showed clearly and, through a gap in the Knapdale hills, Islay could just be discerned. This was a superb view from so low a hill. Behind us, the yellow-brown grasses of winter clothed the moor as it sloped gently up to the hills forming the eastern horizon. And it was into these grasses that we turned our footsteps. *We sympathised with Davie in his pain for some are fellow sufferers. While we were mildly disappointed that he was absent today, we were absolutely devastated when somebody pointed out that so was the kitty! We stopped sympathising.A grass path ran onto the moor and we followed it. Jimmy and Robert led the way, deciding which path to follow at each bifurcation. The gentlest of breezes blew but this is February and the breeze was cool. Coffee was called from the rear and the two sought a suitable place out of the wind. Robert thought he had found the perfect place in the lea of a knoll. But the wind could still be felt during coffee. Robert’s choice of stopping place was called into question and he was derided ceaselessly. In the face of this onslaught, he made a momentous decision. He would never to make a decision again. We won’t hold our breath. Jimmy led the way after coffee, still following the green path as it rose genlty over the moor. Eventually the path disappeared and Jimmy was forced to find his own way through the tussock grasses. And we followed. He led us into a bog. This is the kind of stuff jimmy takes in his stride and today was no exception. This day he was joined by the long-legged Johnny. The pair strode out through bog and rough grass leaving the rest of us to follow in their wake. There was much mumbling and complaining as the rough terrain took its toll. Not that the advance pair took any notice for they still kept the pace up. Round the side of Rigging Hill (Frigging Hill, it was called at one point) they went; through the bog at the head of the burn they went; down through the rough flank of the hill they went and we followed. At last they reached the cleugh at the head of the Gogo burn and waited for us. The burn had to be crossed. Some sought out stepping boulders. Jimmy, clad in gaiters, just ploughed through the shallows. He was followed by the gaiter clad Johnny. And, surprisingly, by Paul. (Is he overcomming his burnophobia?) The rest struggled over their boulders and in the cleugh, just above a waterfall we stopped for lunch. 11:30 and we stopped for lunch! Just after leaving our lunch stop above the Gogo Glen. It was now we missed Holly. Johnny was at a loss, having nobody to throw sticks for. Try as he might, he couldn’t get any one of us to fetch for him. Hurry back, Holly. We were now at the extremity of the walk for the day and, as it was still early, the walk back down the glen was taken casually. We climbed a barbed-wire fence with only two casualties. 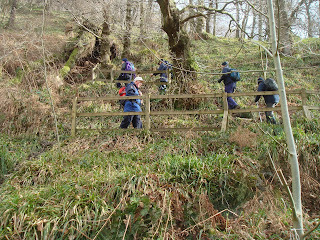 Then we found our own ways down through some rough stuff, gathering at a sheep bucht. Here we found a grass path that took us to join a field road at a wee bridge. This is where we dined the last time we came this was and it was a sun trap then. Not today though for the cloud cover persisted. So we only halted for a few minutes while the photographers recorded the place and the slow two caught up. 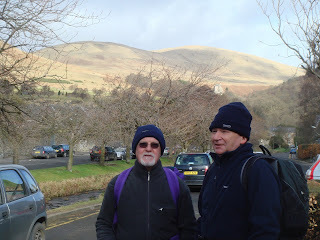 We were to keep to the road now, ambling caually down to Largs. *We sympathised with Davie in his pain for some are fellow sufferers. While we were mildly disappointed that he was absent today, we were absolutely devastated when somebody pointed out that so was the kitty! We stopped sympathising. Only two Ooters were available today, Rex and Davie. 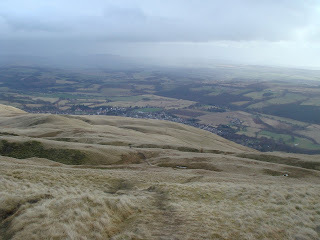 Since Rex had business to attend to at his shop in Girvan, Davie suggested a walk up the Byne Hill. We parked the car at the cemetery wall, Davie thinking that he would just follow his normal route through Brochneil Farm onto the hill. Alas there were notices on the telegraph poles saying that there was no longer a right of way through the farm, which, we discovered from a neighbouring farmer, now had new owners. We were eventually to meet the old crone who now has the farm on our walk of the 26th November 2008 who indeed barred us from going through the gate. 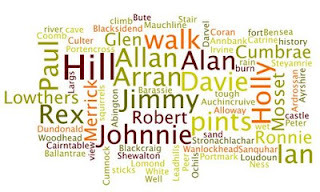 This has been a favourite walk of Girvanites (Girvanians?) and holidaymakers for generations. How can they get away with this? Mumbling a few oaths, Rex and Davie took the longish detour through the other farm and eventually set up the green, grassy slopes of the Byne. It was turning out to be a very pleasant day weather-wise. So once past the cairn and the monument, we decided to cross over to the Grey Hill. 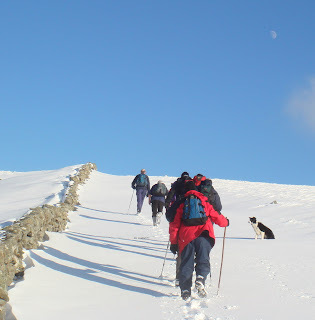 All hillwalks should be as easy as this, you know. 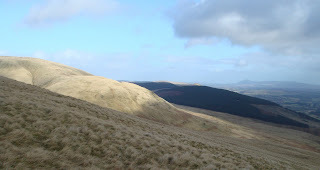 At the top of the Grey Hill, we decided to keep on walking along the path until we reached Pinbain Hill where we had a very satisfying lunch, taking in the views of the Merrick and Galloway Hills and looking across to Ailsa Craig. We returned via the same route. All in all the walk only lasted about 3 hours, but an extremely pleasing day was had. Only Rex and Davie were available today for some reason, now long forgotten. Rex picked Davie up in Darvel and with both bikes stowed in the back of his car, we set off down the M74 for Abington. Davie thought he had sussed this out as a reasonably easy cycle-run, but forgot about the vagaries of the weather. We set off from Abington for what should have been a gentle climb to the village of Leadhills, but with the wind in our face, we even had to pedal on the downhill stretches. At Lettershaws Farm, Davie took the opportunity to show Rex an oystercatcher’s nest complete with eggs. Rex ho-hummed at the excitement of this so we set off for Leadhills; it probably took us an hour or so to cycle the 6 or so miles from Abington to Leadhills so you can guess that the pace wasn’t Chris Hoy standard. Once we had turned left into the Elvanfoot road, we were sheltered so decided to have lunch near the remains of the Risping Cleuch viaduct. It’s a shame they gave this viaduct to the army for explosive practice, for it would surely have been a good idea, possibly a tourist attraction, if the local miniature railway enthusiasts could have eventually extended their line down to Elvanfoot. The bed of the old railway is in perfect nick. Lunch devoured, the intrepid pair got back on the saddles and thoroughly enjoyed the 5 mile freewheel all the way down to Elvanfoot. Joy unbounded! At Elvanfoot we turned left, went under the motorway and onto the old A74, with the river Clyde on our right hand side. At the junction we turned right into the village of Crawford, with its hotels which would have been busy with motorists in a bygone era but which now are decaying and showing signs of lack of patronage. Just before Crawford Mains, we turned right, over the railway, and then left onto a traffic-free single-track road passing the remains of Crawford Castle and a Roman fort. The Clyde was now on our left hand side and this wee road proved to be a delightful road to bike along, being reasonably flat all the way back to Abington. We had our pints in the Abington Hotel which was a bit devoid of atmosphere even although there was a bunch of workmen in, seemingly being stood a drink by the owner. This run is probably about 15 miles and worth repeating in good weather. The scenery is marvellous. The weather certainly did not favour those of us who turned out for the ten mile walk to Eaglesham today. Exactly who was present I can’t remember. Davie had done this walk several times in both directions and was confident that there would be no mishaps, but the best laid schemes …… gang aft agley. We set off up Burn Road, past Templehill (so-called because the Knights Templar had lands hereabouts at one time) and even at this stage of the walk the weather was anything but promising. Indeed waterproofs were donned long before the old school house high above the Irvine Valley; we headed for the last farm, High Overmuir, on this road, passing close to Lochfield, where Alexander Fleming was born. 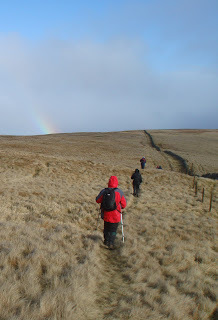 Although rain and thick mist were now the order of the day, Davie’s confidence in his path-finding abilities were still undented and he set off up the Crook of the Lench towards Crook Hill. There should have been a bench here to sit and have lunch on, looking out on the moor. Instead there were roads and JCBs everywhere and workmen busy with the new Whitelee Wind power scheme. It may have been at this point that the Ooters’ motto ubi coitus sumus? came into existence. Davie’s proclivity to get lost in the mist surfaced again as he battled manfully on, pursued by the ever-doubting members of the Werthefekarway tribe. Paul, it was, who eventually sussed, with the help of his GPS that we were heading in the wrong direction. We came across some workmen and asked them the way to Eaglesham, but they were about as much use as an ashtray on a motorbike. Eventually the mist rose a little, long enough for Davie to spot Carrot Farm about ½ a mile away and before long we were back on the road heading down to Eaglesham. Not a good walk, due to the weather and the way Whitelee has been despoiled, but the pints in Eaglesham were nevertheless enjoyed. Since some of us had left cars at this end, we returned to Darvel to pick up the remaining cars. Nine of us turned out for today’s walk, Paul and Rex were the absentees noted. Ronnie joined us again today. 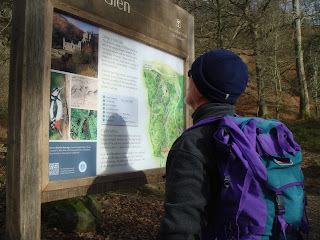 Last week’s sojourn on the northern Kells didn’t put him off and he joined us again today. The weather was lightly cloudy when we drew up in Failford for a short walk along the river but a reasonable forecast and a clearin g sky meant we were hopeful of a good day. Crunchy snow lay on the paths where the sun failed to reach. Today’s walk was to be short for this was Jimmy’s bus-pass do and we were repairing to the Rupee Room in Ayr for a celebration curry in the evening. 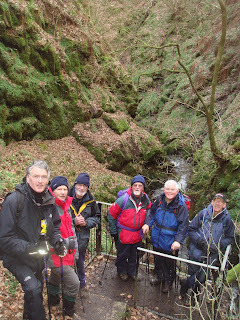 The walk chosen was a repeat tramp of that section of the River Ayr walk from Failford to Stair and back. The route has been travelled often and has been described before so needs no description here. Suffice to say that somewhere along here the promise of the morning was fulfilled when the sun came out. There was a little warmth felt in the sun today but a cold breeze blew and crunchy snow lay on the path where it failed to reach. It was a day of opening and closing jackets depending on sunshine or shade though Davie dispensed with his altogether early in the walk. We came down the river via Peden’s Pulpit for Ian hadn’t been there before and it’s always a nice diversion. Yet two chose not to go there but to keep to the main path. Perhaps they just wanted to be alone, who knows. However, we caught up with them at the top of the brae and we all kept to the main path after this. When we came to the weir at Stair where there appeared to be some debate as to whether this should be an eating point. Jimmy made the decision when he sat down and pulled out his flask. Coffee was taken here. Peter expressed an interest in revisiting a scene from his youth and showing us the same so, after coffee, we crossed Stair Bridge (1745). Immediately, there came an obstacle that showed that we aren’t as young as we’d like to think, an obstacle that tested mature bodies. A five foot retaining wall had to be negotiated. Peter was first up and lent a hand to Robert. Now, with two hands at the top, the operation could be made easier. Jimmy was hoisted without difficulty then Allan but, as the two tired, it became more of a struggle. Poor Johnny’s fifteen stone proved too much and the bold J was precipitated unceremoniously back down the wall. It took two goes and a fair bit of effort to get Johnny elevated. However, we were all eventually hauled to the top of the dyke and found ourselves on the remains of an ancient track. That this track had not been used for some time was obvious from the number of trees fallen over it, mature trees and beginning to rot. Ducking under and clambering over slippy tree trunks brought us to the old hone works. Some had come this way before (24/10/07) but for the most it was new territory. Those who had been here the last time were treated to a potted history by the old boy who was the owner and this potted history was passed on to the newcomers. A few minutes were spent exploring and examining the works. The sheaf of corn relief on the wall was a reminder of the original use of the building, as was the mill-lade behind it. But the pieces of hone-stone picked up by those who do this kind of thing showed its more recent function. Examining the remains of the hone-stone mine.We thought we had finished with the hone-works when we returned to the track but Peter had other ideas. We continued down the track through a pleasant grove of mature Scots Pines to the remains of the hone-stone mine. This was very much new ground for all but Peter and we followed where he led, explaining the different areas of the mine workings. A pleasant few minutes was spent in industrial archaeology mood trying to visualise the place when it was working. But the cold air was getting to the old bones again so we moved on. We came back to the copse of pines and left the track for a few more minutes of archaeological guesswork. And we stayed among the trees, ignoring the muddy track below us for a wee while. But we had to come down to the track eventually. As has become his habit over the last few weeks, Robert decided to slide in the mud and sit down. We think he is developing a mud fetish. But, at least this time there was nae c oo cack in the mix. With Robert returned to the upright, we returned to the bridge of Stair. Some had to be home early so the return upriver was taken briskly and without real halt. We did stop for breathers but not sufficiently long for another peece stop and the appetite was honed for the evening meal. We came back to Failford the back of two (plenty of time for the early hamers) and partook of a jug of ale in the inn there. David and Holly were up Loudoun Hill today. ‘Frae the Coran o’ Portmark,’ It was said so quietly, but so decisively, that all eyes turned towards him as he pointed towards that mountain. The weather gods who had deserted us in January blessed us today with a day of still, frosty air, snow at higher levels and, for a change, bright, and at times warm, sunshine. Nine of us gathered at Green Well just north of Carsphairn for a walk on the north end of the Rhinns of Kells. Rex was in warmer, but hardly sunnier, climes and Alan was enjoying snowbound Northumberland but we were joined in their stead by new recruit Ronnie Thompson. We walked towards the hills, along the Garryhorn road. Somebody asked the date on the bridge but for the life of us, we couldn’t remember the exact date carved on the parapet. Davie was closest with 1936. The date carved was 1935. We should have known this for it was probably built at the time of the Ken/Dee Hydro-electric scheme. We will remember for the future. Maybe! The road continued through Garryhorn and we continued with it, avoiding the frozen puddles, some nearly coming to grief on the icier patches. But without real mishap, we came to the abandoned lead mining village of Woodhead. Here we encountered our first snow, fine and powdery but barely two inches deep. And here, a mile and a half and half an hour after leaving the cars, we stopped at the remains of the old school for coffee. Here Ronnie was introduced to the foibles of the different Ooters - Davie’s propensity to stray in the fog, Robert’s sartorial elegance, Ian’s lunchbox and so on. We were prepared to spend some time here but the cold was seeping into old bones so we moved on. The snow got deeper as we started the climb but not unduly so. Yet, it was enough to hinder progress and make what should be an easy climb, just that wee bit more tiring. ‘View stops’ were called frequently. And the views were worth stopping for, ever changing as we rose higher. 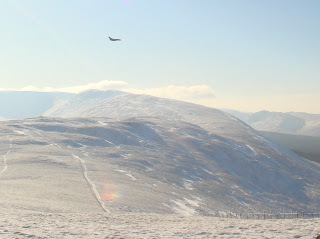 First Cairnsmore of Carsphairn took all the attention, gleaming white under its coating of snow: then the New Cumnock hills with the ‘windmills’ on Windy Standard barely moving in the still air: then the lower hills of the Glenkens with Loch Kenn just visible in the south. The view remained in the east and south for the height of the ridge lay to the north-west and obstructed any distance in that direction. But the eastern views were only a prelude to those we had when we gained the ridge on Coran of Portmark summit. We might have stayed longer at the peece stop for the sun was warm and the air still but the cold seeped into the bones from below, from the snow and frozen ground. We moved on. This was much to Peter’s displeasure for he was eating still. We moved on anyway. We came down a slope, which under normal conditions would be easy, but today, with icy snow, proved anything but. Care had to be taken. Each took his own degree of care and we were staggered once more down the slope. 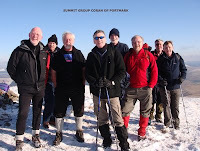 We came together on a col between Meaul and Cairnsgarroch. Under different conditions we might have spotted the King’s Well but the snow blotted out small landscape features so we missed it. Not that we would have stopped anyway for the momentum of the down-slope was used for the upslope onto Cairnsgarroch. By now, we had lost both the westward view and the sight of the lead mines. With the loss of this reference point navigation might have been difficult but with the instinct of homing pigeons, Robert and Jimmy led us across the top to the steep descent of the end of the ridge. Again care was taken on the rough, snow-covered terrain. 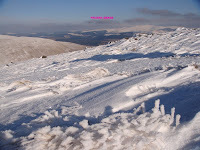 As we dropped the snow gave way but the ground became more tussocky and more difficult. Jimmy had noticed the quad tracks beside the fence earlier in the day and so made for the easier ground. The quad tracks took us down to a ford in the burn. The water was running only ankle deep but it looked icy cold and probably was for it ran off the snow on the hill. The ford was approached with trepidation by most and abject horror by some. But there was no mishap to record and everybody was across the water safely and we now found ourselves climbing gently back to the ruins of Woodhead. An afternoon drinks stop was called. We sat by a ruined wall and reflected on the snowy ridge we had been on and magnificent views we had enjoyed barely an hour before. The walk down the road, though having its own charm, was something of an anticlimax after the high snow. 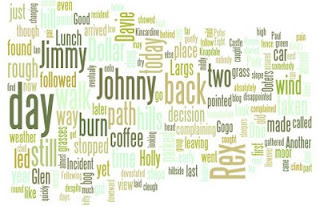 Johnny was heard to enquire if they had somehow added a mile or so onto the road since this morning. It certainly felt like it. However, we arrived back at the Greenwell in plenty of time for fluid replacement therapy in Dalmellington. 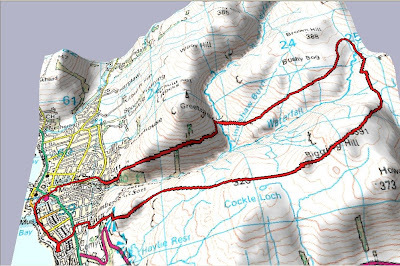 This was a longer walk than many envisaged (17 Km, according to the 3D cartographer) and, given the soft snow we walked through, there will be a few stiff legs tomorrow. But it was a day not to be missed and ranks among the best of the Ooter’s outings. 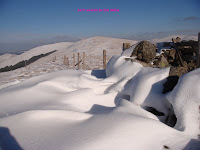 Here is a selection of pictures from Wed 4th Feb 2009. Hope you enjoy . In deference to the age of the players, the team is listed in the classical WW formation. Chosen for his height and knowledge of junior football. Not good when there is a puddle in the goal mouth though – liable to fall in and need rescued. Reliable full back who sticks to his position (wears 69 on his back). However, when visibility is poor, is known to appear anywhere on the park and claim he knows where he is. Due to his prostate problems is easily identified by his long rubber shorts. Claims the best bit of the game is when he tosses at the start of the match. Since his recent operation in France (pictures still available) adds a lot of metal to the defence. Known to take a fetching picture, our huntin’, shootin’, fishin’ wing half learned his trade at Gayfield before moving on to Queen’s Park. Hairiest moment when he was hunting beaver. With a name like Jimmy Johnstone, combined with his dribbling skills and his knowledge of the birdies, he had to play on the wing. Insisted though, that after the week at Mosset, Davie had to play hard up behind him. The hills are alive with the sound of ‘I’m a celebrity, get me doon frae here’. Likes to play downhill, hence is known to change sides at half-time. Likes nothing more than to play with a piece of wood up front. Teamed up well with Kris Boyd at Rangers. Prefers to play Aussie rules and likes to lead the line. Carries little weight other than the rest of the team. Requires to eat regularly, hence plays close to the side lines where he parks his piece van. Needs a little prick every now and again – plays next to Rex. Watch out for coverage of the first game in the Laxative League against Turd Lanark. A friendly (very friendly) has also been arranged with European giants AC/DC Milan. Nine of us - Alan was the missing one today - boarded the bus in Girvan though only two paid. This is the advantage of public transport for the bus-pass brigade. The disadvantage today was the unexpected tour of the streets of Girvan. A convoluted tour it was as well, taking in nearly every street in the scheme. At one point we thought the driver was lost and was trying desperately to find a way out. The irritating thing for the two fare-paying Ooters was that the one or two passengers picked up in the maze also produced bus-passes. Roll on bus-pass day, say they. 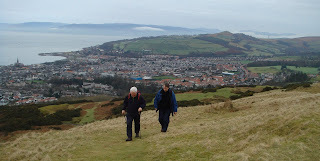 The intention was to complete another section of the Ayrshire Coast Walk, the section between Lendalfoot and Girvan. To do this we were relying on Ian’s local knowledge - many a long summer spent here in his boyhood - and, just in case this failed, Rex’s handbook. As we drove down the coast towards Lendalfoot, it became obvious that the promise of the bright morning would not be fulfilled for, even as we left Girvan, it was noted that fog hung over the low hills of the coast. Decanted from the bus, we felt the cause of this hill fog, a bitterly cold wind blowing over the snow on the high Galloway Hills to the east and meeting the warmer coastal hills. This was not a day in which to hang about. This thought obviously occurred to Ian who took off southward along the main road as if his a*** was on fire. He was heading in the wrong direction, away from Girvan, though he seemed to know where he was going. And, like good little Ooters, we followed in his wake, trusting in his local knowledge. Four hundred metres along the road we left tarmac, came through a field gate and immediate stopped to don mountain gear for we could see where Ian was heading now. Well we might have seen it if the fog had cleared. But we knew where he was heading, upward into the fog. All stopped to don warmer gear, all that is except the bold Ian who strode up the field like a man possessed only to stop when he realised he was on his own. Some reneged at the thought of another foggy climb. It has to be admitted that the scribbler was the instigator of this mutiny - he holds his hands up to it - so must rely on the depute scribe for description of the hill climb. The stalwarts continued the climb but renegade four returned to tarmac arranging a rendezvous for the castle. The wimps came to the Varyag Memorial. Johnny told the history of the famous Russian ship to those who were ignorant and the memorial itself was examined. This was much to Peter’s liking being made of bronze and highly sculpted. It is and impressive piece of work. Then we wandered through the village, took a right, left the sunshine behind and came up the road to Carleton Castle. We thought that might explain the eerie cursing sound we heard emanating from the mist on the hill but it transpired that this was only Robert venting after sliding in the mud and landing on his ar posterior. Two minutes later the hill walkers were seen descending out of the mist. We came together at the castle. 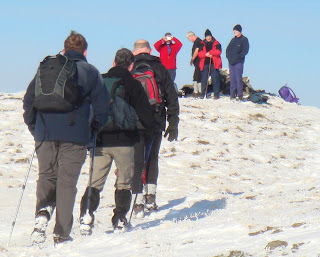 Whilst Jimmy's dastardly mutineers took the low road, Ian's intrepid mountaineers had taken the high road. 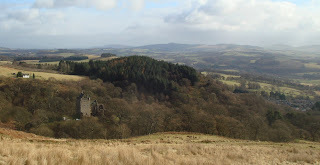 This entailed a steep and at times muddy climb up the sheer face of Balsalloch Hill. As we neared the top we moved into the clouds, but Ian's navigation was spot on. It turned out that we didn't actually need to see the view hidden by the mists because Ian gave an impressive description of the view lying before us, stretching from the coastline of Northern Ireland, around to Ailsa Craig and on to Girvan. We didn't linger on top, cogniscent of the fact that the lowlanders would be concerned about our welfare. 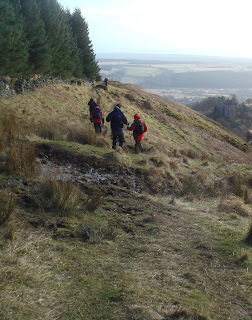 The descent towards Carleton Castle was as muddy as the ascent and as your mutinous scribe has already noted, Robert managed to fall into a mixture of glaur and coo cack, an event greeted with general mirth on both sides of the divide. Peter searched for treasures on the beach while we took coffee. Somebody suggested coffee at the castle but Ian had other plans. There was a spot down by the beach, in the sun and out of the wind so down the road we went, back to the main road. Once more Ian turned us southward, away from Girvan. However, this was only for a few metres before we turned off the road to a picnic table by the beach. Some had coffee at the table but it was still in the cold wind and the sensible took theirs in the lea of a garden wall, looking out to sea. Somebody suggested coffee at the castle but Ian had other plans. There was a spot down by the beach, in the sun and out of the wind so down the road we went, back to the main road. Once more Ian turned us southward, away from Girvan. However, this was only for a few metres before we turned off the road to a picnic table by the beach. Some had coffee at the table but it was still in the cold wind and the sensible took theirs in the lea of a garden wall, looking out to sea. It was a short coffee stop for some felt the need to move on to stir the blood against the cold so we moved off towards Girvan. And, an hour and bit after leaving the bus we left Lendalfoot. The trudge along the main road was only interesting in the seaward direction for the road was busy with heavy traffic and the fog still hung over the high ground. The enclosed monument to the drowned fishermen was looked at, the surf breaking on the shore was commented on and the birders looked for their feathered friends. This, combined with the usual blethers, took us towards Kennedy’s Pass. The observant among us saw the old Turnpike road slanting up the hill and, when we reached a field gate with a track heading towards it, we were for this way. But Ian had local knowledge (and had read the book) and pointed us further along the road. We turned into an old quarry from which there appeared to be no escape. We doubted Ian. Oh! we of little faith. Our glorious leader led us to a parting in the quarry wall. A track lead steeply up through this and we were directed up the track by he who knew all along. And, as we climbed the track, the sun broke through the hill fog to shine on us for the rest of the day. Striding out on the old turnpike road.We were now on the old Turnpike road, high above the new road and looking out to sea. We strode out. At the old toll house, we sat down for lunch. We carried on along the old turnpike after lunch, enjoying the views seaward. Eventually this dropped us to sea level again but stayed to the east of the main road for a while yet. However, it was muddy at this level and Ian’s lugs were abused for it was thought that he led us here. Ian emphatically denied this and blamed it on the book for this was new to him as well. We believe him. Then the mud finished and we were decanted once more onto the main road. A good walk in places but the sections beside the main road were somewhat uninteresting. The harbour Bar provided the FRT for today.